If you travel frequently then you’re probably sick to death of airline food, terminal fast food outlets and petrol station snacks. Especially if you have a food intolerance or severe allergy. Also, it’s true that most of us find controlling our weight and maintaining a healthier diet easier when we have access to familiar food or food that we have prepared ourselves. For these reasons, it can be even more convenient to take your own food with you, especially if you want to look after yourself better. Here is a selection of takeaway containers to fill with your own food when travelling on business. We’ve included both hot and cold containers, all offer a tight seal and some are exceptionally lightweight. Remember: if you’re flying then you won’t be able to take more than 100 ml of liquid through security with you. This includes yoghurt, soups, jellies, hummus and juices. 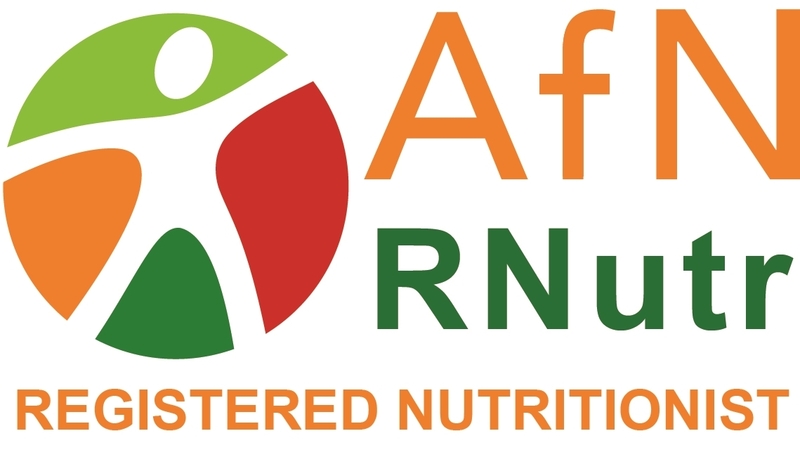 However, you are able to take larger quantities of solid items for snacks and light meals comprising rice, protein, fruit, vegetable, nuts and whole-grains. This bento box is perfectly segmented for carrying your various lunch, sushi or snack items on to a plane. It is easy to clean and segments can be reconfigured using the removable sections. This box is also extremely light-weight and compact. Top-tip is to pack your food the night before and place into refrigerator. Reviewers report that items such as lettuce will keep crisp and the box surprisingly holds a good amount of food. Suggested (alternative to sushi) food items include; boiled eggs, rice salad, couscous, Greek salad, pasta, bean salad, vegetable wraps, crudites, cold preserved meats slices, smoked salmon, mackerel, cheese squares, protein balls, fruit such as grapes, mixed berries, clementines and kiwifruit. 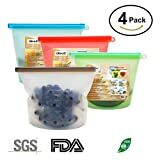 These silicone bags are ideal if your packing space is in short supply. They are completely airtight and have a leak-proof vacuum seal with a ziplock. The bags can withstand temperature from -50oC making them perfect to store prepared food in the freezer, taking them out prior to leaving home. The bags are also microwaving safe, resisting temperatures up to +250oC. Perfect for continental style mix of foods such as cold meats, cheese, bread, oats, banana & nut mix, fruit salads, whole fruits such as grapes. Items to make in advance for freezing overnight could include Spanish omelette slice, breakfast wraps, scrambled egg and smoked salmon wrap, vegetable and egg muffins. Made from 100% BPA-free silicone they are durable, lightweight and reusable. Either rinse in water at your destination or chuck into the dishwasher when back home. Weighs only 132 g per bag. 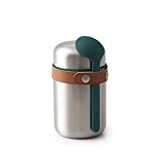 This leak-proof vacuum insulated flask is perfect for hot and cold food provision when travelling. It has a robust stainless steel body with a twist top to prevent spills and fits nicely in hand luggage or side pocket of computer backpack. It keeps food piping hot for six hours. Alternatively, it can keep food cold, without the need for additional coolers, for eight hours. The flask also comes with a spoon attached by a strap to the flask. Suggested meals include; noodles with stir-fry chicken, salmon with rice, couscous with beef, and hot or cold pasta-based dishes. Alternatively, you could also bring an empty flask with you and purchase a soup or hot meal to fill it up once through airport security. Weight is only 350 g for flask and spoon. For the environmentally conscious, the flask is made from eco-friendly polypropylene, HIPS, silicone and artificial leather. If you’re looking to save space, then this one dish collapsible container might be the answer. It goes flat when empty, taking up little space in your briefcase, handbag or even coat pocket. The lid is tight with the bowl when filled or empty. The thick walls are sturdy, so you can store your food without the risk of spilling, and are also heat insulating so you can keep food warm for a short period of time. 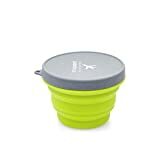 This collapsible container is microwave safe and freezer proof withstanding temperature down to -40oC, making it ideal for cooking food within it and refrigerating or freezing the night before your journey. In case you’re wondering, some airport lounges have microwaves for their business travellers to use. Suggestions for food items prepared the night before include; egg fried rice, Chilli Con Carne with rice, Paella, pasta bake, Thai chicken curry with rice, Frittata and Shepherd’s pie. Also suitable for grain-based or mixed item salads. 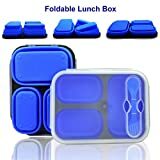 For those of us with a larger appetite but with little room to spare, then the collapsible folding bento-style lunch box is another option. It is also made from silicone, so is microwave, refrigerator, dishwasher and freezer safe, and won’t hold onto smells or tastes. Simply cook your food, if possible in the container, and store them either in the freezer or refrigerator until your journey commences. The separate compartments not only keep the food items separate but it also provides a portion control system if you are on a weight loss or maintenance diet. Vegetable couscous salad, chicken or tofu satay, and banana muffin. Spicy lamb kofta’s, red & wild rice salad, and peaches with a serving spoon of yoghurt. Filled tortilla wraps, cheese with crackers, and fruit salad. Pasta & pesto salad, cold meats or cheese, mixed dried fruit & walnuts. Leaf salad with pitta fingers & hummus, mixed bean salad, dried apricots with cheese cubes. Chicken with stir-fry vegetables, noodles, mango and pineapple slices. Although this is a collapsible option, it is heavier in weight than the items above. Weighs 460 g. Accompanied with a spork. 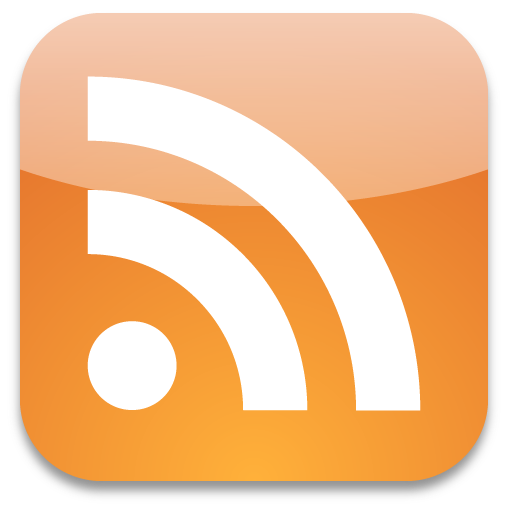 Share the post "Five easy to store, take on board meal containers"